Get away from it all in our centuries old hamlet of six restored stone houses surrounded by the beautiful countryside of the Dordogne, South West France. 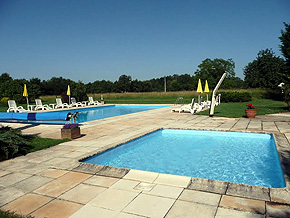 At L’Echappée Verte we offer our guests the use of a securely fenced, open air swimming pool heated from mid May to mid September. In addition the mini football pitch, play area, table tennis, boules and badminton provide all day outdoor entertainment. This quiet, unspoilt haven offers open space for children to explore, excellent forest paths for running or cycling, and shady walks through the forest to explore nearby hamlets and villages. There is plenty of wildlife (large and small!) for the observant and an impressive number of wildflower species in the surrounding meadows. If you can drag the children away, there is even more to do visiting the medieval towns, historic castles and spectacular caves in the region, and the richest collection of prehistoric sites in Europe. Then there’s the canoeing, horse riding, karting, aerial assault courses and the other attractions of the Dordogne, not to mention the renowned Perigord cuisine and the local Bergerac, Monbazillac and Cahors wines. All the gites are fully equipped, with ovens, fridges and microwaves and with dishwashers in the larger houses, whilst barbecues are found on the private terraces. The pool bar has a range of books and games plus French and and UK terrestrial TV/DVD. Internet access is available. Bed linen and towels are also included. Poolside towels and baby equipment can be provided on request. A separate room includes washing machine and dryer with ironing board and iron for use as you wish at no additional cost. We’ve also arranged for the local boulangerie to deliver freshly baked bread and croissants every morning during peak season. A welcome pack of basic breakfast essentials plus a chilled bottle of wine awaits your arrival! We live on site and speak both French and English, and are pleased to provide local information and tips to help you enjoy your stay. Should you require us to make reservations we are only too happy to oblige. Whilst most of our properties are let from Saturday to Saturday in peak season, we are happy to be flexible where possible. So, please choose the accommodation suitable for you, or if you are not sure, feel free to email or call and discuss your requirement with us.